Ryan Bader claimed the Bellator Heavyweight Grand Prix title here at The Forum with a devastating left hook, right hand combination to finish legendary Russian Fedor Emelianenko and write himself into history. It made Bader, of Arizona, a champ-champ in the burgeoning fight league owned by media conglomerate VIACOM. Bader’s ascent to become both light heavy and heavyweight champion was shown simulcast on Paramount with OTT streaming service DAZN also airing the event. Emelianenko dropped to 38-6, Bader wracking up his twenty-seventh victory. Bader was magnanimous in victory. “He’s one of the best to ever do it … ,” Bader said in his cage interview with John McCarthy following the quick finish. Bader, 35, said he had blocked out the historic performances Emelianenko has enjoyed during his career as a former Pride Fighting Championships heavyweight champion who reigned with 27 consecutive victories over a decade before a 2010 loss to Fabricio Werdum in San Jose. 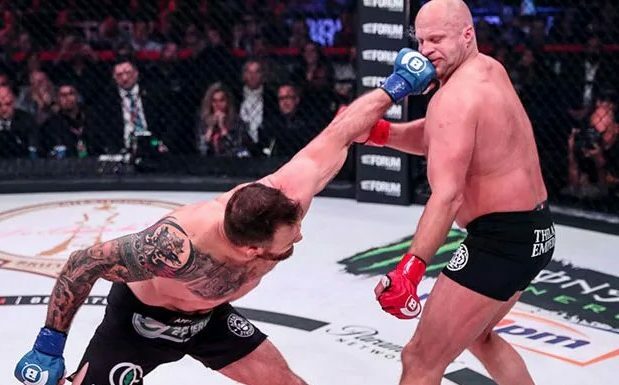 Bader, who had prepared to use his standout wrestling skills and renowned cardio to nullify Emelianenko revealed that he had consistently practiced throwing the left hook off his jab. “I saw him go down pretty hard. We practiced that [punch for when] he was setting up that right hand,” Bader said. As in the main event, there was another brutal finish recorded in the co-main event. Henry Corrales responded to a knockdown uppercut from fellow Whittier fighter Aaron Pico, his counter right hand punch landing flush on Pico’s jaw, the brutal fight ending 67 seconds into the first round. Pico might have used his fine wrestling when Corrales was hurt, but the bout became a defining moment for Corrales, trained in Arizona by John Crouch and Benson Henderson. They are some team. “What’s done is done. Who the [heck] is next?” Corrales asked inside the cage. “That’s five straight [victories while training in Arizona]. I’ve got my stuff together.” Corrales, Coker commented, put himself into title contention with the triumph. Earlier, with UFC bantamweight champion T.J. Dillashaw, former UFC title challenger Joe Stevenson and UFC featherweight Cub Swanson in his corner, Juan Archuleta claimed a controversial bantamweight victory against New Jersey’s Ricky Bandejas. The judges awarded Archuleta (22-1) victory by unanimous-decision scores of 29-28. Archuleta now wants a showdown with Bellator bantamweight champion Darrion Caldwell later this year. Former soldier Adel Altamimi (8-5) opened the nationally televised portion of the card with a first-round submission by armbar of Brandon McMahan. On his Bellator debut, Altamimi was accompanied in his post-fight interview by actor Chris Pratt, who has befriended the fighter while training alongside him at a gym in West Hollywood. Former WWE heavyweight champion Jake Hager, making his MMA debut on the Bellator card, defeated J.W. Kiser by submission. Elsewhere, Bellator made it official that its incumbent welterweight champion Rory MacDonald will face Jon Fitch on April 27 in San Jose, where the title will be defended within the welterweight grand prix tournament. Additionally, Veta Arteaga will challenge Ilima-Lei Macfarlane for the women’s flyweight world title on the same card.